Google chrome is a good browser but it has a drawback. the drawback is it's video autoplay facility. If you open a page that have lot of videos then you will not be able to open other pages due to video autoplay. So how to stop video autoplay? Follow these below steps. 1- Write "chrome://flags" at address bar. 2- Search "Autoplay policy" by using Ctrl+F keyword. 3- Now you can see "Autoplay policy"
4- Now select "Document user activation is required" from drop down list." 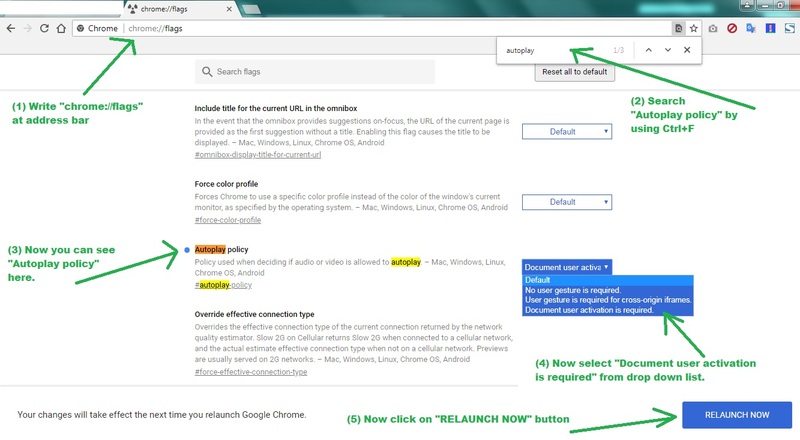 5- Now click on "RELAUNCH NOW" button. For more detail information see below image.